The minimum age to join the tour is 12 years. As this tour includes 9.5 km of walking, please consider your child's level of fitness before booking. What to bring: Light jacket, sun hat & protection, closed walking shoes, water. 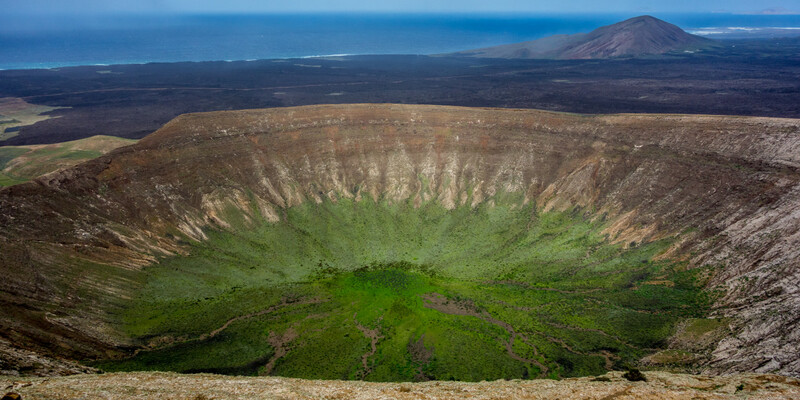 The top of Caldera Blanca is a breathtaking reward to this 9.5-km (6-mile) trek. 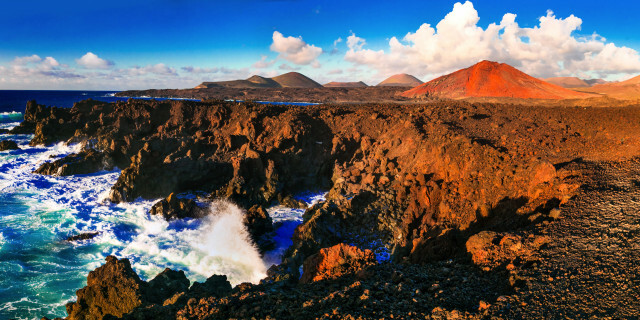 Offering panoramic views of the Timanfaya National Park, the crater sits in an incredibly rare ecosystem that protects original species within the area. Our expert guide makes sure you understand the evolution, and why it is such a special place. We begin our day with a pickup from your hotel at 9:00 a.m. This trek can be a challenge for some, but we move at a comfortable pace and provide walking sticks if needed. 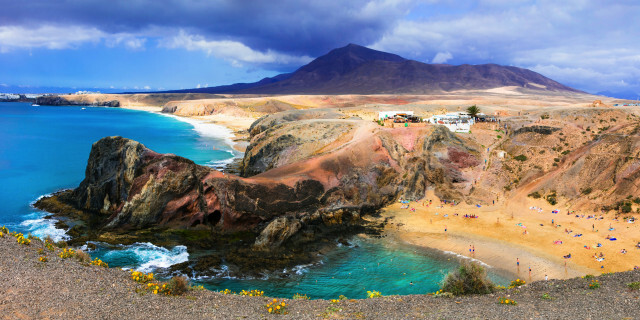 All you need to bring are closed walking shoes, sun protection, a light jacket, and curiosity about the wonders of Lanzarote's volcanic nature. Our exploration of Caldera Blanca starts right away as we move through a sea of dried lava, making our way to the volcano's base. Our guide explains hydromagmatic volcanism, and how the famous Timfaya eruption created the black-lava surroundings we see today, over two centuries later. 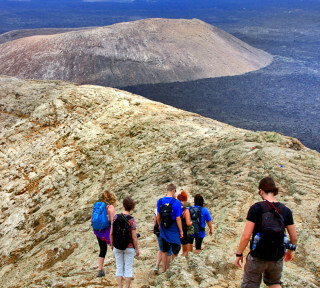 Once we reach the top of the crater - standing at 458 m (1,500 ft) - we circle the entire rim, which is about 1 km (0.6 m) in diameter. 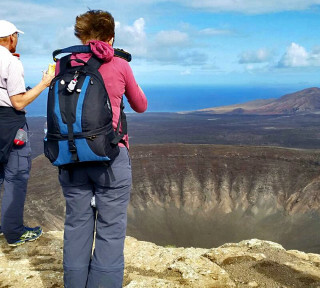 Observing a striking visual contrast between young and old volcanic landscapes, we rest a little and enjoy the views before beginning our descent. 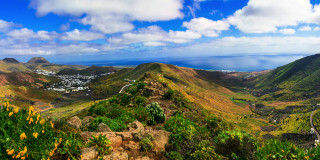 The habitat created around Caldera Blanca has allowed original species of flora and fauna to survive. This happens when new lava surrounds an older landscape. Our guide explains it all, making sure to provide details about vegetation like wild tobacco, launeas, euphorbias, and ice plants. There are also many opportunities to birdwatch, another one of our guide's passions that he gladly shares with the group. About halfway through our tour, we enjoy a pleasant picnic lunch, which can accommodate any allergy or food intolerance if you let us know in advance. And thanks to our guides' dedication to sustainability, the food and its packaging are always eco-friendly. 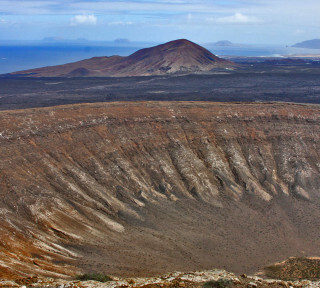 The perfect island, the perfect crater, the perfect tour. After we've taken you back to your hotel, you are guaranteed to have a perfectly unique memory. the tour was just perfect as well as the service. great team, great tour. love it.